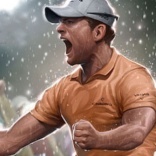 When you start Winning Putt (and after completing or skipping The Golf Academy) you'll be directed to The Main Square. This is the place where you can decide what you want to do. Other than in most sport-games or golf simulators it's not just a menu where you can make a choice, but a true virtual world. You can walk around by using the cursor keys on your keyboard or even more simple just point your mouse to a spot somewhere on The Main Square and double click the left mouse button. A little flag will become visible at the spot you just clicked and your character will run to the spot you specified. There're really many things to choose from on The Main Square. Too many to review in detail right now. I will make separate guides for each of them. 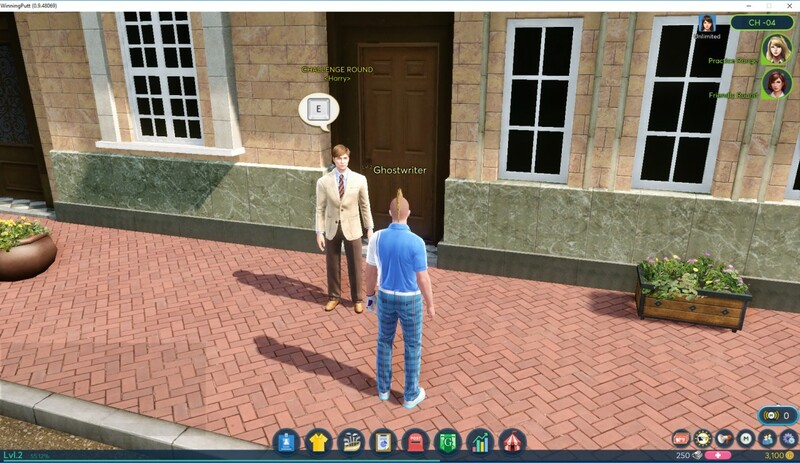 Next to choosing a certain location on The Main Square you can also point your mouse to one of the other online players walking around (or standing idle). You can see their level, nickname, experience and the guild they're belonging too if any. When you hover over a player you will see a little icon appearing instructing you to click the right mouse button. 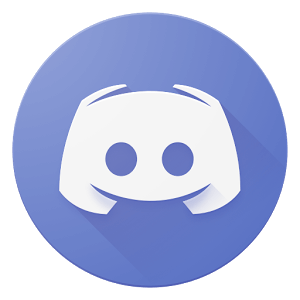 If you do so, a menu will pop up with extra options like player info, add as friend, invite the player as companion, view more details about his/her guild, chat, send trade requests or even block the person if he/she annoys you. The Practice Range hosted by Lucy. Good to practice a bit more. Friendly Round hosted by Barbara. Best place to raise your level as a new player. Tour hosted by Antonio were you can participate in tournaments. Ranked Round hosted by Claire available when you have at least reached level 10. Challenge Round hosted by Harry. Available when you at least have reached level 10, become a Junior Pro and pass the qualifying test at the Ranked Round location. The Time Attack Registration Booth (not hosted by anyone) available if you have reached at least level 13. Betting Round (access to the Green Tee Club) hosted by Victoria but only accessible when you have reached at least level 18. The Club Shop hosted by Kelly. Package Club Shop hosted by Droxon. Golf apparel shop hosted by Isabel. The Insignia shop hosted by Yvonne. The Golf Supply Shop hosted by Arnold. The Enchanting & Fitting Van hosted by Oswald. The Repair Centre hosted by Evan. The Support Agency hosted by Bruce. The Market Place (not hosted by anyone). The Craft-O-Matic (not hosted by anyone). The Event Shop (not hosted by anyone). 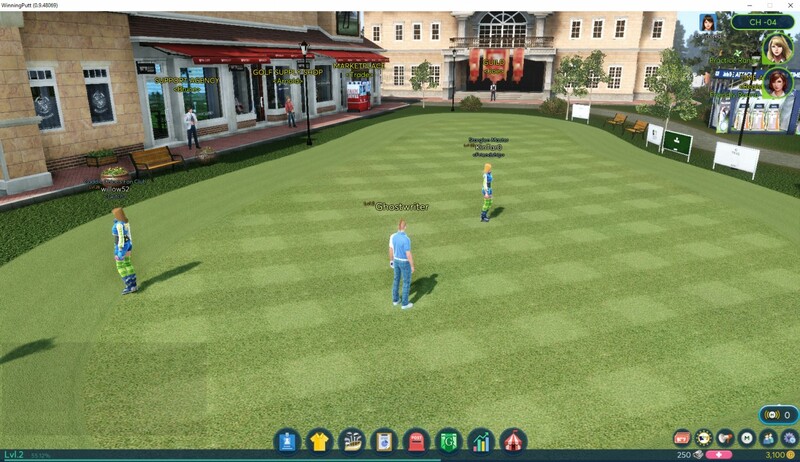 You can also go back to the Golf Academy (hosted by the sarcastic Christina) and either start over again with the basics or participate in The Course Master games, a series of tougher golf courses than the ones in the Golf Academy part were you can earn all kinds of rewards. Last but not least there is The Guild hosted by Joe. Here you can become member of a guild or start one yourself. Accessing the different locations on The Main Square is very simple. Go to the location the way described earlier and when you approach the host close enough (or the location itself when there is no host) you will see a bubble appearing with the letter 'E' in it. You can start hitting all the keys on your keyboard now, but only if you hit the 'E' key you will continue to the next screen and enter the location itself. If your level is too low or you don’t have access for another reason a message box will pop to inform you. Overall The Main Square has a very nice and easy to use interface. The first time you're playing Winning Putt you'll probably be exploring a lot because there's so much to see and to do here. In my personal opinion a little bit too much shopping options, but it’s still you as player who will decide either to go to these shopping locations or not. If you only want to play a good game of golf, or socialize a bit with other players that's certainly possible.